French designer Emmanuel Babled has reworked his marble sculptural chair into a piece of upholstered home furniture for Swedish brand Offecct. Shown at Salone del Mobile in 2017, the original piece was created primarily as a sculpture, and made from 250-kilograms of marble. It was spotted by Anders Englund, Offecct's design manager, who proposed turning it into a fabric covered chair to be used in the home. "[The chair] that was first made as a work of art has now evolved into furniture in Offecct lab," said a statement from the furniture company. To adapt the original design to be suitable for use in home the brand worked with Babled to develop a piece that was 15 per cent smaller in size and covered with upholstered fabric. "Our design is exploratory, creative and playful," said Englund. "The way we work has many similarities to the artistic process, so it's natural for us to bring art and furniture together and at the same time challenge the boundaries between the two." The remodelled piece, which was presented at this year's Salone del Mobile, closely resembles the original marble structure in shape. It is available in dark blue, red and pink and has an ergonomic form and can spin 360 degrees. "The versatile use and the phenomenal shape that consistently change by the 360 degrees turning makes it to a living sculpture and fit very well in to modern interiors, as a single piece or several connected on a row on the platforms," continued Englund. Babled's original marble sculptural standalone shell was designed to resemble the wings of a butterfly and the rounded forms of 1960s Scandinavian furniture. "I also thought of famous Scandinavian furniture from the 1960s shaped like big shells and with rounded and soft shapes. The mission was to make the chair feel welcoming and to inspire people to let their bodies sit or lie in relaxed, comfortable positions," said Babled. Lisbon-based designer Emmanuel Babled formed his studio in 1992. He is a guest lecturer at Domus Academy in Milan and the Design Academy of Eindhoven. He often creates sculptural pieces, including a series of lighting for Priveekollektie. 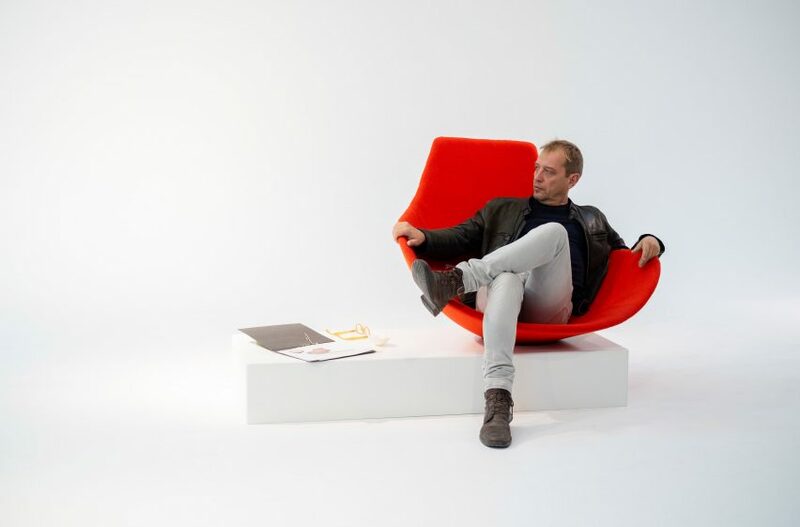 Swedish brand Offecct often collaborate with external designers. Examples of works include a series of acoustic work panels based on designs by Frank Lloyd Wright and a modular sofa by British designer Lucy Kurrein.